Well, the "foreseeable future" for the Barclays Center doesn't look like a long time. Some five days after arena operators told the New York Post they had swapped metal detectors for handheld wanding "for the foreseeable future," those waiting on line to get into the ticket office this morning (for free tickets to boxing Oct. 20) had to go through those metal detectors. Maybe there's a distinction, in their mind, between entering for events and entering the ticket office, and maybe the crowd was small enough for the tactic not to cause delays, but it still seems inconsistent. Are they particularly nervous about the people on line for the freebies? 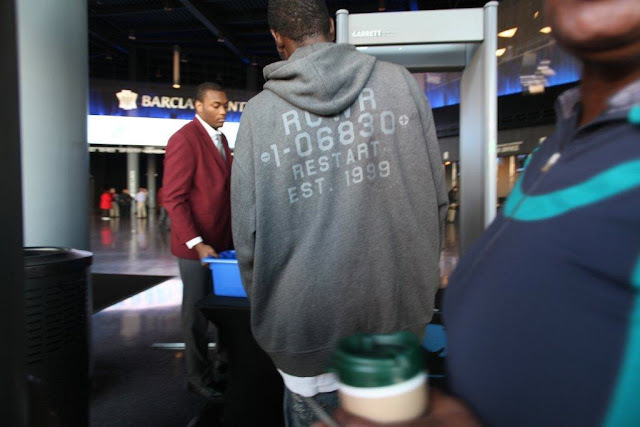 A visitor told me that, when Barclays Center staff were asked about the use of metal detectors, they said they couldn't talk about it. Update Oct. 19: detectors "being transitioned out"
The Atlantic Yards Report blog posted a photo of the detector being used as the patrons lined up for the freebies. Hours later, after all the free tickets were taken, a Post reporter watched the same detector being used on customers heading to the box office to order or pick up tickets to other events. ...Joe DePlasco, an arena spokesman, said the two detectors “are being transitioned out by the end of the week.” He said both had remained in place after the arena's many other detectors were removed Oct. 11. Last night, the remaining two were finally removed in time for a Nets’ exhibition game. Looks like the end of the week came quickly. By the way, credit to the "Atlantic Yards Report blog" is a step up from the previous credit from the Post, "Twitter commenter Norman Oder."